You all are so supportive. I blogged yesterday about a nail art design I quickly hated. I've heard some very kind words from my readers regarding that manicure that I wasn't expecting. I honestly thought, and still do think, that was one of my least favorite posted manicures. I wasn't fishing (or is it phishing?) for compliments or support, just stating a fact, and I received all well-wishes and happiness from some admirers of the design. So thanks for that unexpected pick-me-up. You're now looking at a scalloped funky french. It's very frilly, but the color adds a definite sexitude to it. Black and any pastel screams negligee, even if it's simple. 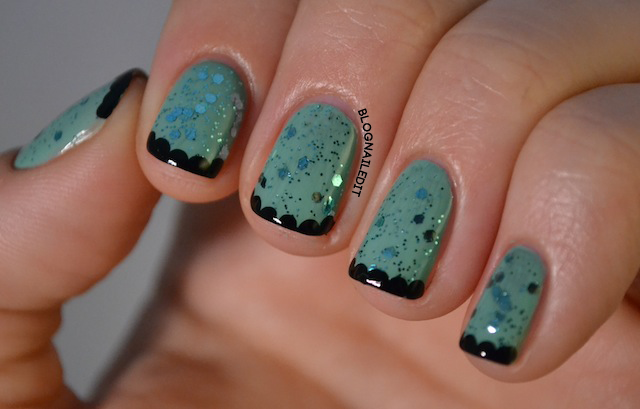 The black tips are done with Black Creme (Wet n' Wild) with a dotting tool. Swimming beneath is Mermaid's Tears (OPI) and Nostalgic (L.A. Girl). I can't resist a glitter. I love when comments do the ole pick me up thang! I've been slacking in my comments on your blog and I apologize! I am loving this one-I'm a sucker for a funky you know! Hey now-thank you for disabling your word verification! WOOHOO! Very pretty! Love the scalloped french idea. I really love the glitter layered over Mermaid Tears! Gorgeous! Uma das mais intressantes que já vi! Ficou muito bonita, incrível mesmo! Adorei seu blog!